Having been born and raised in Dallas, I’ve had the chance to live in several of its neighborhoods, everywhere from the then fledging northern suburb of Fairview (20 minutes to get to the nearest grocery store! ), all the way down to a loft in the area known as Deep Ellum, dotted with nightclubs of all kinds, cool little art stores and awesome hole-in-the-wall places to eat (if you watch Diners, Drive-Ins and Dives, you’ve probably seen Deep Ellum and East Dallas mentioned a few times). For the last several years, I’ve happily called East Dallas home and really can’t ever see myself living anywhere else in the city. I love East Dallas for its laidback attitude, funky little stores, the closeness to the lake and real feeling of community that the residents have here. Two of the places that most epitomizes both the funkiness and the unity of the neighborhood are Jimmy’s Food Store and Tom Spicer’s FM 1410. Jimmy’s opened in 1966 and has been a staple of the community ever since. Jimmy’s transitioned from a grocery store to an ethnic market for the local African, Cuban, Mexican communities, but it only sold Italian specialty items during the Thanksgiving and Christmas holidays. All that changed in 1997 when Jimmy’s current owners, brothers Mike and Paul, made the decision to focus on the Italian foods of their heritage. Since then Jimmy’s has become the premier market for all varieties of authentic Italian imports – vinegars, olive oil, pastas and what has to be the most extensive collection of wine representing all the regions of Italy. But in addition to all that food fabulousness, I think it’s really the feel of the place that brings people back. It’s the warm smiles, the unmistakable feeling of family and the knowing that all your fellow shoppers are truly your neighbors. Maybe not by their address, but most certainly by the history, food and community that Jimmy’s provides. The rich, welcoming smell of cappuccino, rows of fresh pasta, a delectable selection of fresh meat, cheese and produce, along with locally baked breads and a sandwich shop are more delicious reasons that Italians and Italians-at-heart come back to Jimmy’s time and time again. But in addition to all that food fabulousness, I think it’s really the feelof the place that brings people back. It’s the warm smiles, the unmistakable feeling of family and the knowing that all your fellow shoppers are truly your neighbors. Maybe not by their address, but most certainly by the history, food and community that Jimmy’s provides. This is the muffuletta at Jimmy’s. The small one. FOR $7 BUCKS. After a cappuccino (my first ever. love, true love. ), my friend and I head to the back counter and order lunch. A small muffuletta for me, a meatball sub for her. Shopping while we wait, I pick up a couple of rounds of homemade pizza dough, a jar of imported Alfredo sauce, Texas goat cheese, some olive oil and a bag of freshly made shredded mozzarella cheese. Sandwiches and Italian bounty in hand, we head to the little tables inside the front of the store and dive in. 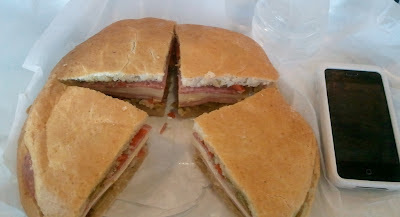 This is the small – SMALL – muffuletta. For $6.99. You could feed a family of four with that thing! We barely manage to make a dent our sandwiches before crying Uncle and taking the rest to go. Back out into the sunshine and down the street to get the stars of this pizza-to-be. Just a couple doors down from Jimmy’s is Tom “Spiceman” Spicer’s produce-packed gift to our city. Bursting with fresh, exotic produce like seasonal wild mushrooms, fiddleheads, and sea beans, this is where the chef’s shop and thankfully, so can those of us living out our chefy dreams at home. The small storefront is the perfect getaway from the bright Texas sun and inevitable sighs of relief come from everyone as they step into its dim light. I always make a beeline for the large glass counter towards the back. In a previous life it sheltered deli meats and cheeses; today, the case is filled with exotic mushrooms of all types and bags full of peppery arugula and just about any kind of leafy greenness you can think of. Just past the counter and through the backdoor lies Spiceman’s garden. And I mean GARDEN. Rows and rows of anything he can grow. I am completely green with envy. Except for my brown thumbs, of course. If I can’t grow gorgeous produce, I’m glad there’s Spiceman to do it for me. Brown bag full of various wild mushrooms and arugula in hand, I’m already thinking about what I’ll buy the next time I visit as we walk out the door. Serves: I’m sure this would serve more than one person but I’ll never find out. Mine. All mine. For the garlic oil: Break a garlic clove into 2 or 3 pieces, place in a small pan and cover with olive oil. Heat on low heat for 15 minutes. Remove garlic clove and pour flavored oil into a squeeze bottle or other container. Refrigerate when not in use. Discard after a week. Once the pizza’s shape is formed, brush the pan with some olive oil and place the dough on the pan. Lightly brush the dough, including the edges, with the garlic oil. Spoon the Alfredo sauce on top of the oil and spread evenly over the dough. Add mushrooms and sprinkle on the garlic and then the mozzarella. Crumble the goat cheese over the pizza and season with salt and pepper. Bake pizza on the bottom rack of the oven for 6-8 minutes. Remove and scatter the arugula over the pizza. Drizzle with olive oil and enjoy!